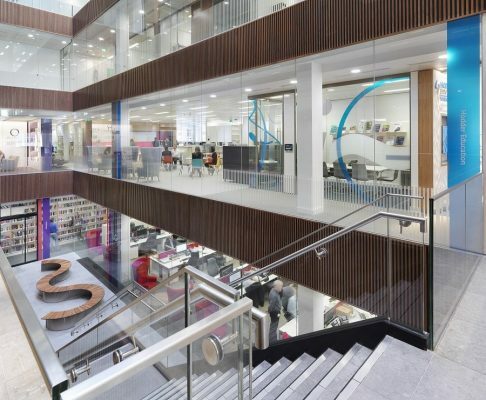 HOK’s interior design team and fit-out contractor Overbury have transformed the central London headquarters of publishing giant Hachette UK into a contemporary, 100,000 sq.ft. workspace. Hachette’s move into Carmelite House, which is located in a prime position on Victoria Embankment and was the original headquarters of Lord Northcliffe’s publishing empire, brings together the company’s seven publishing divisions under one roof for the first time. HOK’s plan creates a work environment that enables each division to maintain its own brand identity within the overall Hachette brand, whilst facilitating company-wide collaboration and a sense of community. Using ‘the family’ as a metaphor for Hachette’s publishing divisions, HOK drew on inspiration from the design of the classic family home to create the shared and dedicated spaces within the building. Each publishing division is seen as a family member and provided with its own designated areas, such as meeting rooms and arrival points, which encapsulate its brand personality. Shared spaces include the reception, non-dedicated meeting spaces, kitchen and break out spaces. HOK’s design creates an inviting, agile work environment with many activity-based areas for individual and group work. Arrival spaces for individual divisions offer an immediate, customised brand experience that can be seen on each of the five floors from the central atrium, creating a smooth transition between shared and divisional spaces. 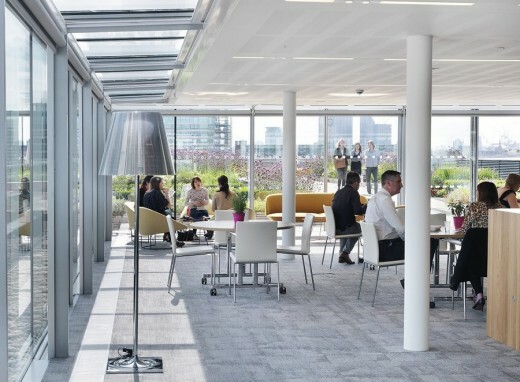 The fully open-plan office space encourages company-wide collaboration and communication, removing all private offices and eliminating physical barriers between colleagues. The pavilion café on the sixth floor takes advantage of the building’s outdoor space, extending through large glass doors to a 7,600 sq.ft. landscaped rooftop terrace, complete with flowerbeds and grass areas with sweeping views of the London skyline. This café space acts as a gathering area to foster collaboration, encouraging employees who come to the building from different offices to interact and engage with each other. The dedication of this space to all staff, rather than to an executive function, has had a significant impact on the organisation’s culture. As the former office of Associated Newspapers, Carmelite House has a Grade II listed brick facade dating back to the late 1890s and is recognised as an early surviving example of newspaper architecture along Fleet Street. HOK’s design retains an iron staircase, lift and several wall paintings as important examples of decorative commercial architecture. HOK provided consulting and interior design, with Overbury as main contractor. APS was the project manager and quantity surveyor. Other consultants included the Anslow Partnership as mechanical and electrical engineer and WSP as structural engineer. HOK is a global design, architecture, engineering and planning firm celebrating 60 years of design and innovation in 2015. Through a network of 25 offices worldwide, HOK provides design excellence and innovation to create places that enrich people’s lives and help clients succeed. DesignIntelligence consistently ranks HOK as a leader in sustainable and high-performance design and recently named HOK the #1 most-admired firm for leadership in technology innovation.